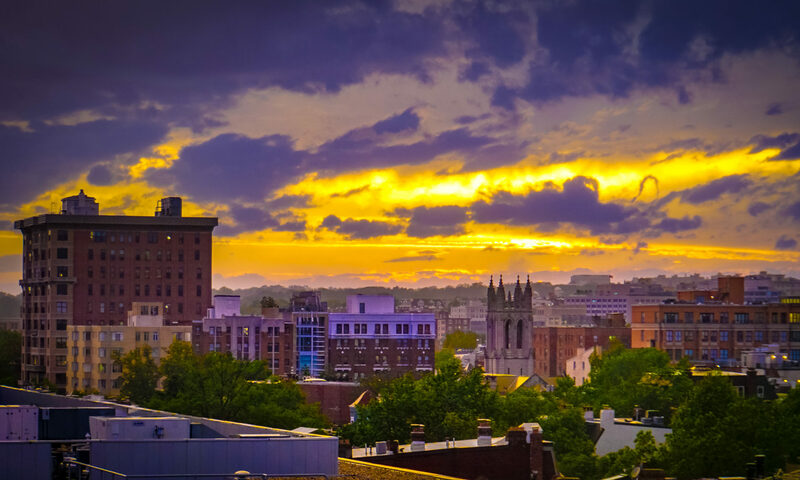 This is part 3 in a series on health care and climate change, or “Prevention is the new health information technology,” based on my learning prior to ACPM2012. You can see all the posts here. 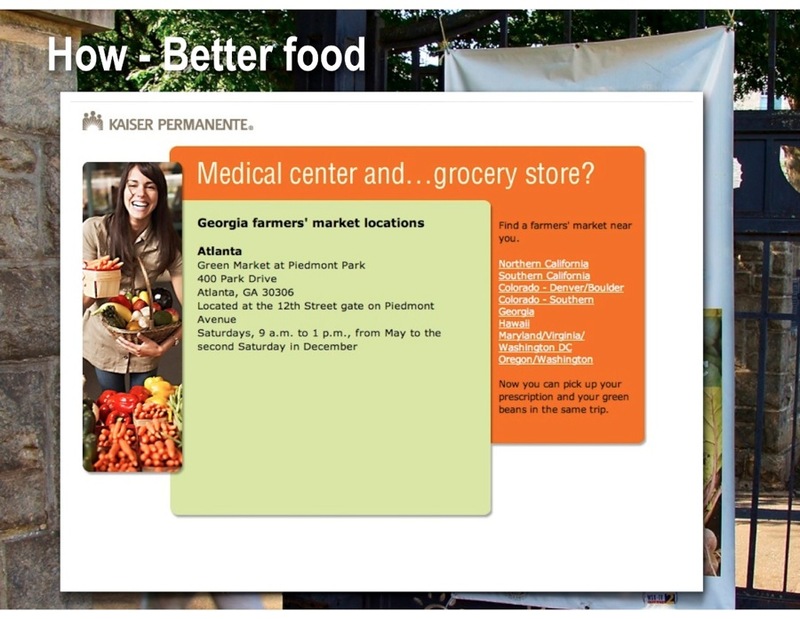 The first slide above is from the Kaiser Permanente web site, advertising a farmer’s market. When I was in Atlanta last year, I decided to go walk and check it out, at Piedmont Park. And sure enough it was there, and active (my photograph is the next slide). 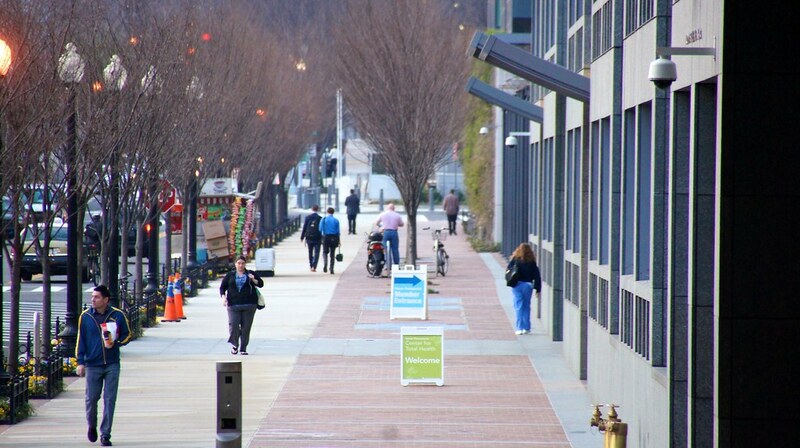 This one is co-sponsored with City of Atlanta Parks, Recreation, and Bureau of Cultural Affairs. 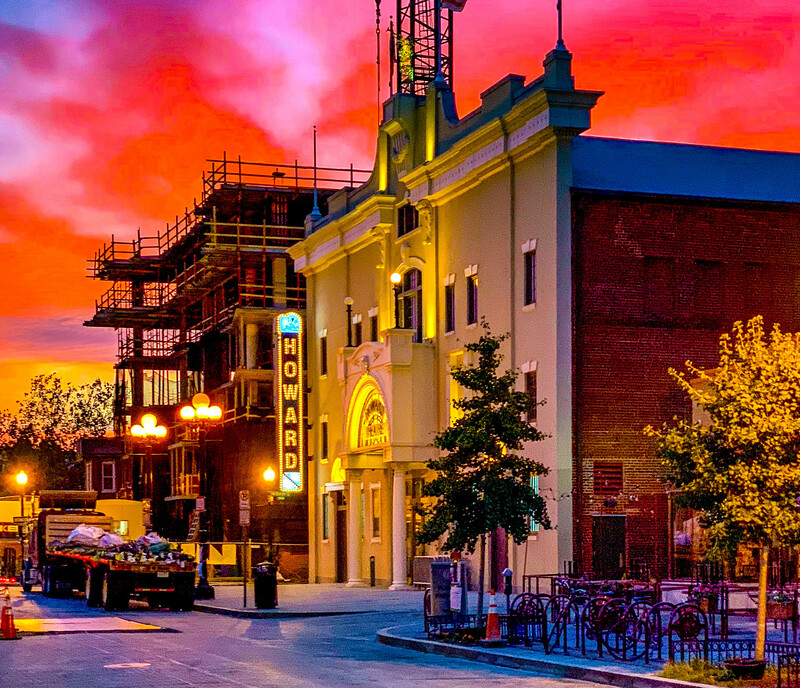 There are 39 more of them connected to Kaiser Permanente communities and facilities that Kaiser Permanente operates. The next slide is Preston Maring, MD. Preston is a force of nature. 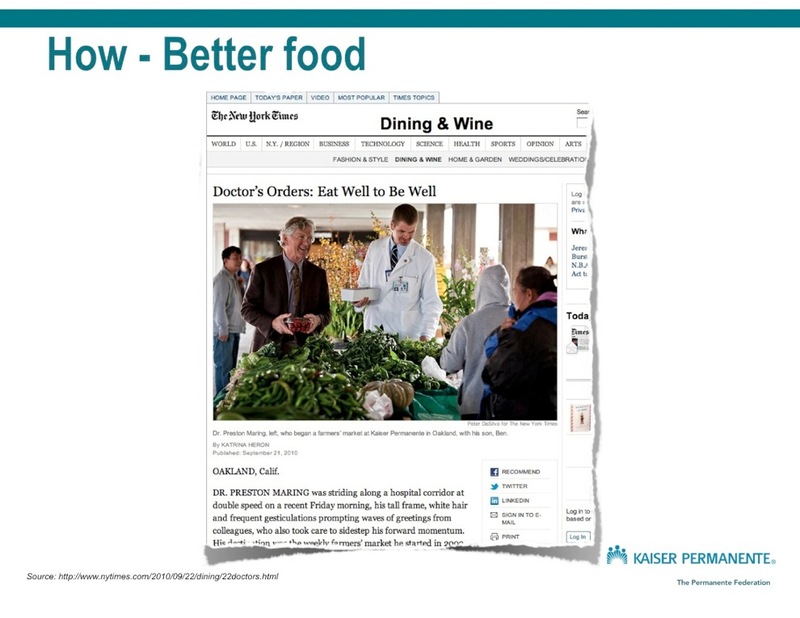 He’s a surgeon, and he founded the first hospital based farmers market in 2003, at Kaiser Permanente Oakland, and his journey is nicely written on his very own blog, Dr. Maring’s Farmers’ Market and Recipe Update (Kaiser Permanente’s first blog!) as well as a New York times piece profiling him. He brings cooking tools and does demonstrations to fellow clinicians and leaders at every opportunity. This photograph was taken at the annual meeting at the Kaiser Permanente Care Management Institute. Because of his influence, I ordered a knife sharpener on the spot from my mobile phone, AND I learned to cut squash on the diagonal to keep it from rolling off the table. That alone changed my life. Preston’s story is one of a single physician bring a passion for improved health forward. It’s never too late, and a single person can make a difference. He’s gone national and regional, branching out to invite other health care systems to join in sourcing food locally, together. 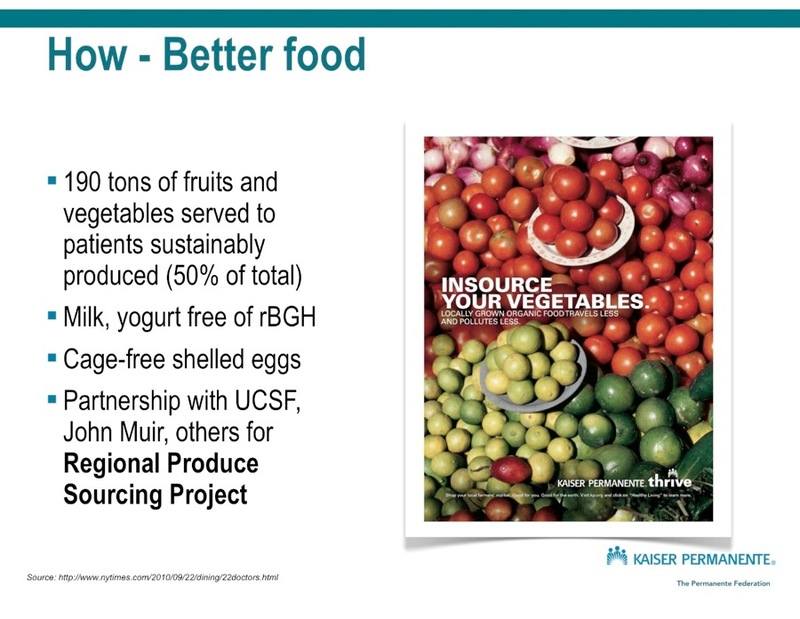 Kaiser Permanente set a 3 year goal in 2010 to increase sustainable purchases (of all foods) from 7 percent to 15 percent. This goal was reached in 10 months. Currently the number is 50%, and affects 190 tons of fruits and vegetables. 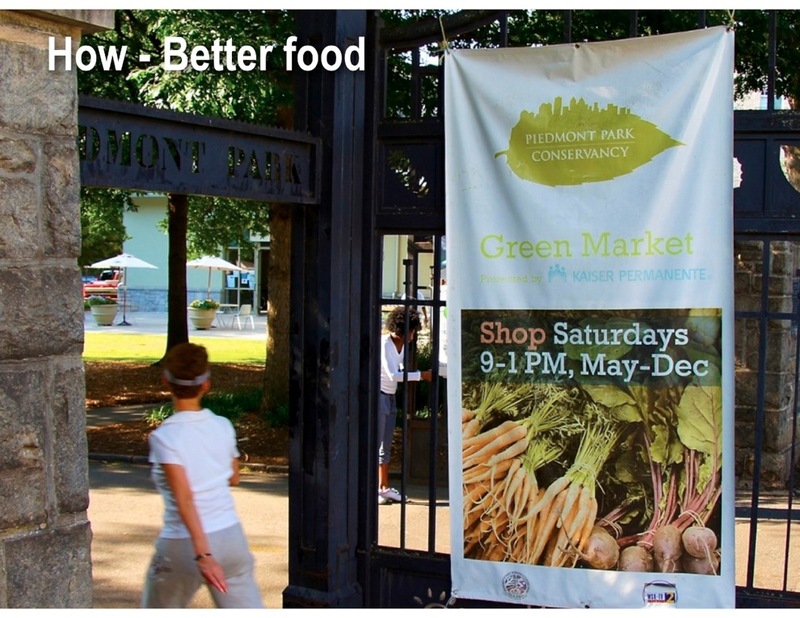 Sustainable purchases include 190 tons of fruits and vegetables (50% of produce purchased) (corrected 02/21/12). There’s help for other physicians who want to promote healthy changes to food in their hospitals and health care systems, most notably the green guide for health care, and health care without harm. Check them out. A lot of other hospitals have. This is another example of the ability of health care to attend to vital health needs of people under our care, and at the same time support a healthy community. We don’t want to undermine all of our work to heal and be healed. 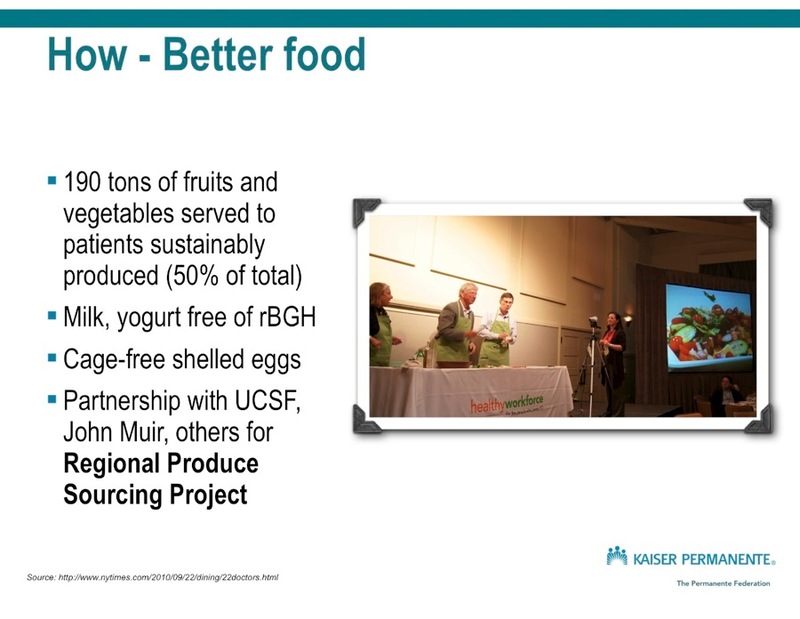 I’m going to write a separate post on this, which is about my admiration for Kaiser Permanente’s care in planning meeting food, working with vendors and venues to enforce sound food choices. If your organization plans meetings or you go to meetings, you can grab these guides and use them too. If you want to get on this now, here’s the link: Healthy Meetings Thrive . 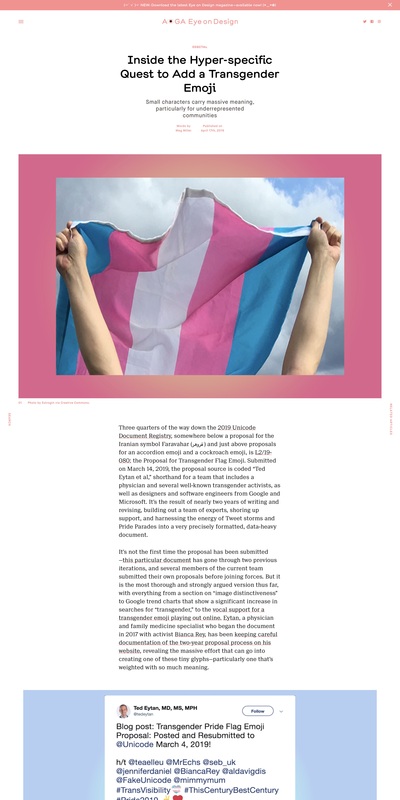 Download the PDFs and present them to your meeting planner. They are carefully crafted to be easy to follow. Your waistline will thank you!